The Children’s Center Rehabilitation Hospital is honored to announce this year’s high school students participating in the VOLUME (Volunteer. Observe. Learn. Unify. Mentor. Explore.) Summer Program. 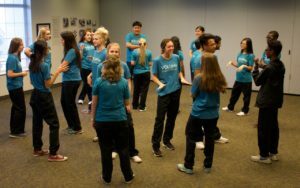 The program is focused on providing teenagers insight into the medical, rehabilitative and educational services offered at the Hospital, while allowing an opportunity to work directly with the Hospital’s pediatric patients. VOLUME students playing a get-to-know-you game. The VOLUME Summer Program will take place in June and July at The Children’s Center Rehabilitation Hospital. To learn more about the program, please click here.